The DA leader has branded this coming Friday a ‘national day of action’ over the situation regarding SA’s struggling power utility. 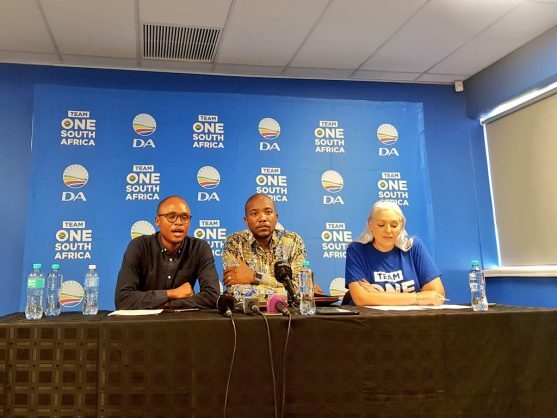 At a press conference on Monday morning at Nkululeko House in Johannesburg, DA leader Mmusi Maimane announced that he would be mobilising South Africans to take to the streets this Friday – in what he had branded a “national day of action” – to protest what he described as “ANC corruption, looting and [the] mismanagement of Eskom”, adding that he wanted parliament reconvened so that the issue could be dealt with. “On 1st April, SA will wake up to the shock that electricity and fuel prices will increase,” Maimane said. He went on to describe his personal experiences with load shedding over the past weekend. “I was in Parys over the weekend, when there’s load shedding the town is shut down, and when you go to our townships, power cuts is a common occurrence. “There must be an inquiry to the circumstances surrounding the potentially imminent threat of the collapse of our national grid. We must invite stakeholders and experts from the industry to come and give input on the Eskom crisis,” he continued. Maimane added that he had sent a letter to parliamentary speaker Baleka Mbete demanding that she reconvene parliament. “It is clear that there exists no plan to fix this mess at all levels of national government. From the president, to the minister of public enterprises, to those at Eskom – there exists no plan and no political will to take immediate action to get our country out of this ANC-created crisis. “It appears as ‘business as usual’ for national government. The president is more focused on pleasing those within the ANC, while his brother-in-law, Energy Minister Jeff Radebe, is running rogue trying to secure multibillion-rand oil deals in South Sudan,” he added, referring to a story that was published in The Sunday Times this past weekend. According to Maimane, “it is a breach of the Constitutional duty of members of parliament (MPs) to be out campaigning when they should be rolling up their sleeves and implementing solutions to address our national energy crisis”. The letter he has sent to Mbete invokes Rule 253 of the Rules of the National Assembly, which states that an ad hoc committee may be established during the “adjournment of the Assembly for a period of more than 14 days, by the speaker after consulting the chief whip and the most senior whip of each of the other parties”. This means that the national assembly could still be reconvened until the day before elections, which will take place on May 8. Moving for any urgent, necessary legislative amendments to existing legislation and regulations to deal with the potentially imminent threat of the collapse of the national energy grid and the threat it poses to the national economy. The party has also launched a petition on their website, calling on South Africans to “support” the party’s “plan to save Eskom”. It currently has just over 50,000 signatures.